Corporate Event Photography of the Art of Time 2013 Grand Launch in Pavillion, Kuala Lumpur by the Malaysian Minister of Tourism Yang Berhormat Datuk Seri Nazri Aziz. TEAM KIDCHAN is honored to be appointed as the official Photographer for the Grand Launch of Art of Time 2013 by Swiss Watch Gallery, the premier Malaysian owned regional luxury watch retailer which representing the most comprehensive collection of the world’s luxurious, finest and iconic timepieces under one roof at Pavilion, Kuala Lumpur last year in 2013. At the event, among the line-up of brands that under Swiss Watch Gallery are include, Cartier, Graham, IWC Schaffhausen, Jaeger Le-Coultre, Tag Heuer, Ulysse Nardin, and the ultimate in luxury phones – Vertu. Making its debut at this international showcase include notable brands – Piaget, Zenith and Tudor. The Grand Launch ceremony was officiated by the Guest of Honour, Yang Berhormat Dato’ Seri Mohamed Nazri bin Abdul Aziz, Minister of Tourism and Culture of Malaysia. Also the Grand Launch was attended by many key business partners, watch enthusiasts and media. 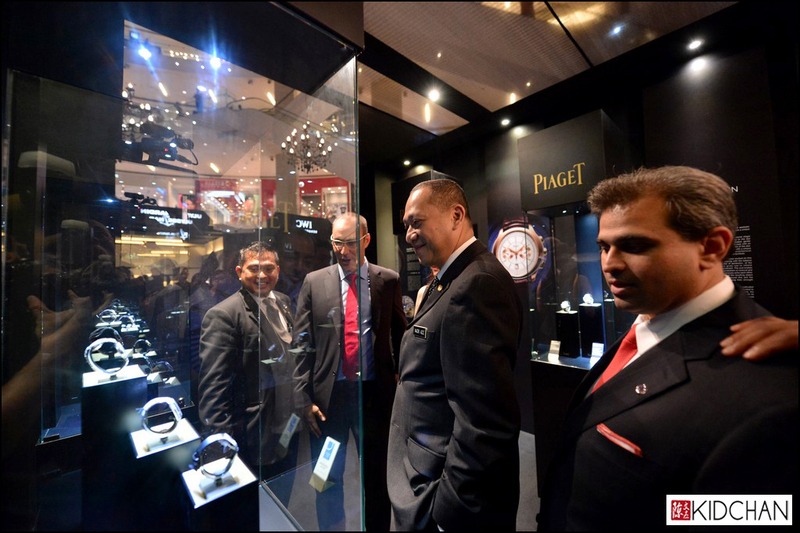 After the ceremony, The Honourable Minister then toured the exhibition which included a Haute Horlogerie Espace featuring key highlight timepieces from the participating brands. During the tour, Yang Berhormat witnessed a live demonstration by Ms Rachel Jacot from Ulysse Nardin, showcasing the intricacies of miniature painting on dials to the. The exhibition set to be mesmerised by highly coveted and imaginative horological works of art from the world’s leading watch brands, which include limited and rare edition timepieces, high jewelry timepieces including grand complications and other imaginative and avant-garde pieces, many of which will be unveiled for the FIRST time in Malaysia.